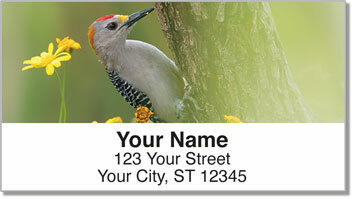 Four red-headed woodpeckers are featured on this design - but there's one mysterious species you won't see. The Ivory-billed woodpecker was once the largest woodpecker in the world, and could be found across the southeastern United States. It looks somewhat like the Pileated Woodpecker, but it's unclear whether anyone has actually seen one of these rare birds since the 1940s. Various sighting remain unconfirmed. However there's still hope. Ornithologists and biologists still offer rewards of as much as $50-thousand to anyone who can find the elusive creature. 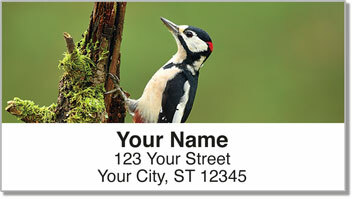 Woodpecker Address labels feature original wildlife photography that will give your outgoing mail a distinctive look. They'll also make it much easier to prepare letters and packages to send. 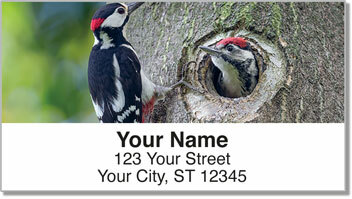 Get your own Woodpecker Address Labels today! 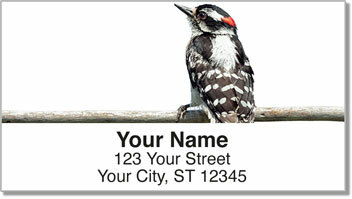 This design is also available to order as matching personal checks.